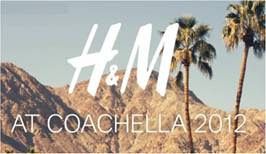 It's H&M's third year as a sponsor of Coachella and they are planning some really amazing initiatives. For the first time ever Coachella will stretch over two weekends and the lineup includes heavy hitters such as The Black Keys, Radiohead and Dr. Dre. This year H&M will offer an exclusive escape and interactive experience inside the H&M tent. The Swedish retailer will recreate a NYC loft oasis in the middle of the desert, where visitors will have the chance to view H&M’s newest Fashion Against AIDS collection, relax in air conditioning, hydrate at the H&M water bar and recharge - all while helping support AIDS research. Unique refresh and recharge stations will include a Water Bar and complimentary Kiehl's products, including much-needed moisturizer, sun block, toner, dry shampoo and deodorant, as well as hand sanitizer and wipes. H&M staff and models will be on hand at the tent to show off the newest Fashion Against AIDS apparel, a collection aimed to create awareness about HIV/AIDS. For the fifth consecutive year, H&M is committed to the fight against AIDS with its newest Fashion Against AIDS collection. Launching in more than 300 stores on April 26th, 25% of proceeds will benefit AIDS awareness organizations. The FAA collection brings together a myriad of global styles, prints and artist illustrations - fused to strengthen a greater universal message in support of youth AIDS awareness. Be it colorful African trims on blouses and bustiers, graphic black and white Maori prints on leggings and crop-tops, or the folkloric Inuit designs from Greenland on draped T-shirts, this year’s FAA collection repositions global tribes in a 21st century context. H&M will also host two photo booths, where attendees will have the unique opportunity to “Kiss for a Cause.” Photos will then be printed and added to a collage in the tent. All Instagram users that upload photos coupled with the hashtags #kissforacause #hmusa, will be printed and added to the inspiration board. Additionally, H&M will donate $1 to AIDS research for every Foursquare, Twitter or Instagram user that mentions the hashtag. H&M has a history of supporting musical festivals, including past sponsorships of All Points West. This is also the 5th year H&M’s Fashion Against AIDS collection will donate proceeds to AIDS research.